Word of the day: Scheveningen strand (Scheveningen beach) – Welcome to the Direct Dutch institute, The Hague. Some ninety years ago in 1927 the famous Irish novelist James Joyce, his wife Nora and daughter Lucia visited The Hague for a short vacation. They stayed at a hotel in the Spuistraat close to the Passage. The hotel has disappeared and the building which is opposite the new Paagman bookshop now accommodates a Blokker. 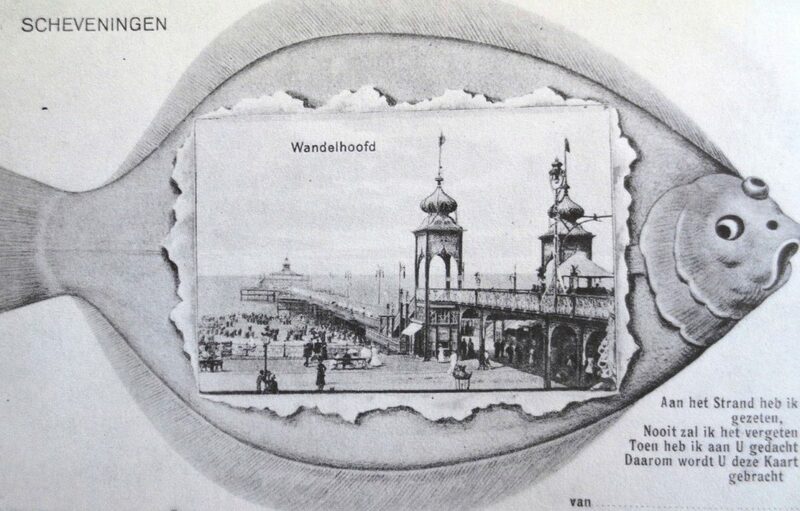 They took the tram to Scheveningen to enjoy the sea and the beach. James Joyce was not very fortunate because he was attacked by a ferocious Dutch dog and lost his glasses while defending himself. Below you can find the letter with the anecdote that he sent to his publisher Sylvia Beach in Paris. Next Monday I’ll publish the letter that his wife Nora wrote about their visit to The Hague and Scheveningen. Note that Joyce talks about the strand and not the beach: ‘The strand is wild and endless.’ In the twentieth century the word STRAND was already very archaic. Joyce must have seen this word on the tram in amusement. STRAND and ‘beach’ have an interesting history that you can read if you follow this link. … At Scheveningen there is scarcely a soul on account of the cold spell so we stay in the town and tram it out: it is only about 10 minutes. Here it is very quiet and dear but the people are very civil and obliging and not rapacious really. It is the exchange and the small things do not hit them at all though to us they seem terribly dear. The strand is wild and endless. Unfortunately I had a dreadful time with a savage dog on Wednesday 25 inst. My wife and Lucia had gone for tea and I walked on a mile or so and lay down on my overcoat reading the baedeker and trying to make out the coastline when the brute rushed from Lord knows where at me. I beat him off a few times. His owner ran up and his mistress and they got him down but he slunk round when their back was turned and attacked me again in the same way fully four times. It lasted I am sure a quarter of an hour. In my alarm my glasses got knocked and one of the lenses flew away in the sand. When Madame or whatever she was finally lugged the animal away growling the owner and I went down on her knees and after groping for a long time found the lens. I feel so helpless with those detestable animals. Revolver? I suppose he would have me before I made up my mind to fire. Or carry stones in my pocket?